Recently, many Windows users are frustrated with Vista/Win7's new search. 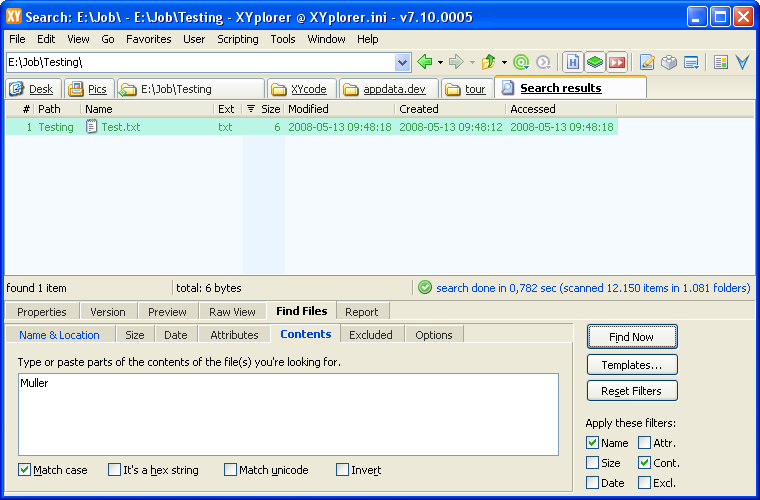 Well, XYplorer's search works as you know it from XP: Enter a search term, press 'Find Now', and find what you are looking for! It's easy because you already know how to do it. XY's search is a live search that doesn't need any index. If a file exists XY will find it. You are looking for a file having "Muller" in the name, and you know it's somewhere in folder E:\Job\. 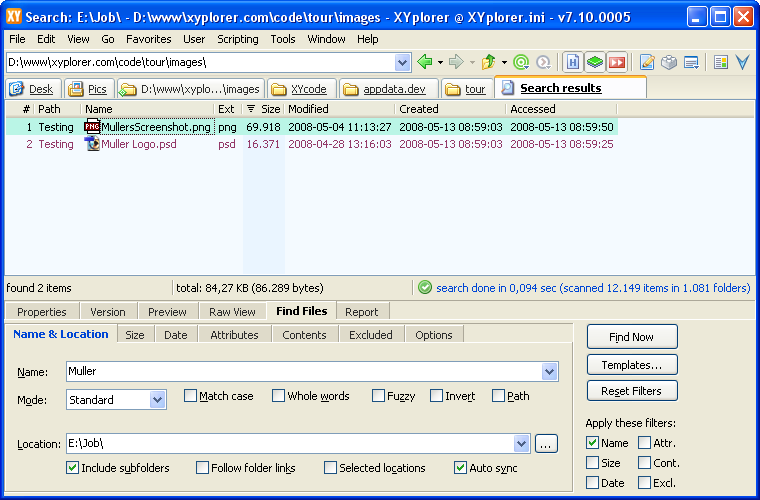 Open the Info Panel (press F12), select the Find Files tab, and open Name & Location. Press the "Find Now" button (or F3). That's it. Within a few moments the files you are looking for are listed in a special tab called "Search Results" and ready for further processing. It's as simple as that! You are looking for a file having the word "Muller" somewhere in its contents, and you know it's somewhere in folder E:\Job\. Tip: Content searches take longer than mere name searches because all files have to be opened and read in completely to do the matching. So, if you know the file type of the files you are looking for, you should state it in the name field to speed up the search. You would, for example, set the Name field to *.doc; *.csv; *.txt to confine the search to DOC, CSV, and TXT files. Note: In the above screenshots the Navigation Panel has been hidden to give all the screen space to the Search Results. The minimalist Quick Name Search (F3) interface provides an alternative to the mighty and powerful Find Files tab. This page has been written 2008-05-13. The screenshots don’t reflect the current look of the application. Some of the functionality might have been changed or enhanced in the current version.